We know we sometimes go overboard with our love of the great and timeless Hollywood icon known as Nicolas Cage, but there was absolutely no way we could pass up the opportunity to write about Cage freaking out about something music-related the way we do when our favorite bands do cool things. Nicolas Cage made a surprise guest appearance earlier this week at Revolver’s annual Golden Gods heavy metal awards. 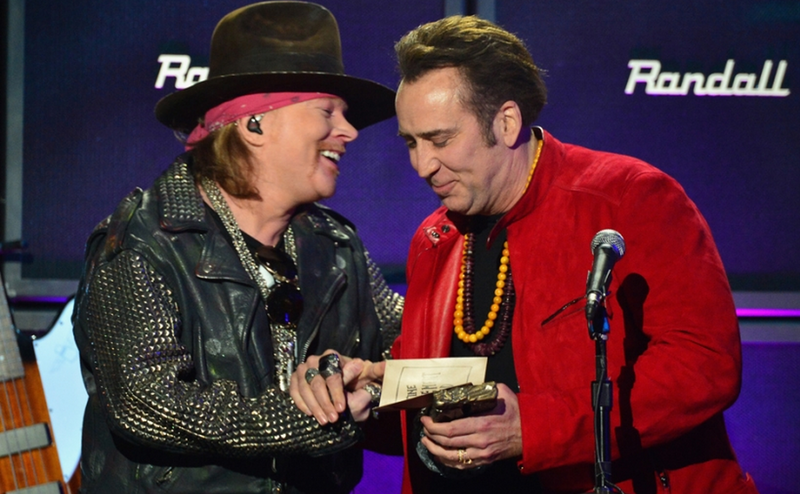 The show was just beginning to wind down when the time came to present the lifetime achievement award to Guns N’ Roses frontman Axl Rose, which was introduced by comedian Andrew Dice Clay. After a short video montage of Rose in his prime was played, many expected the man himself to come on stage, but instead Nic Cage walked out to add his two cents to the night’s proceedings. He opened up to the audience and viewers at home about his deep admiration for Rose’s work and unique style, then called him a maverick while welcoming Axl to the podium. The look on Cage’s face that follows is akin to how many of us must look when rubbing shoulders with someone we idolize. You can view the clip below (Cage comes on at 3:05). There have been rumors that Guns N’ Roses are working on new music, but after the debacle that was Chinese Democracy we are going to wait a little longer before getting excited about something that may never actually happen. Cage, on the other hand, has plenty of work lined up for release in the months ahead. His latest feature, Tokarev, was just released overseas and should land stateside before fall. He is also set to lead the reboot of Left Behind, which is expected to roll into theaters sometime this summer. Rock on, Nic. We love you. Was in Vegas last week for the Megadeth concert at the Palms and Nic Cage was one row down from me with his arm around a very wasted Vince Neil whispering to him the entire time. It was really strange. They got up and left so we moved over to their seats only to have their bodyguards tap us on the shoulder, I turn around and there is Cage with his wife just staring at us like “WTF?” I had to take the walk of shame, heads bowed, right past him to our own seats, lol!!! It seems like he is maybe wanting to make the transition from movie star to metal rock star with all of these appearances!